Cover photos: Josh showing women at Umi native Tetragonula clypearis bees in transferred into a rectangular beehive box. The native bee program Switpela Bi Hani is creating excitement in PNG’s Markham Valley as local communities discover the true nature and potential of their ubiquitous little black ‘flies’. 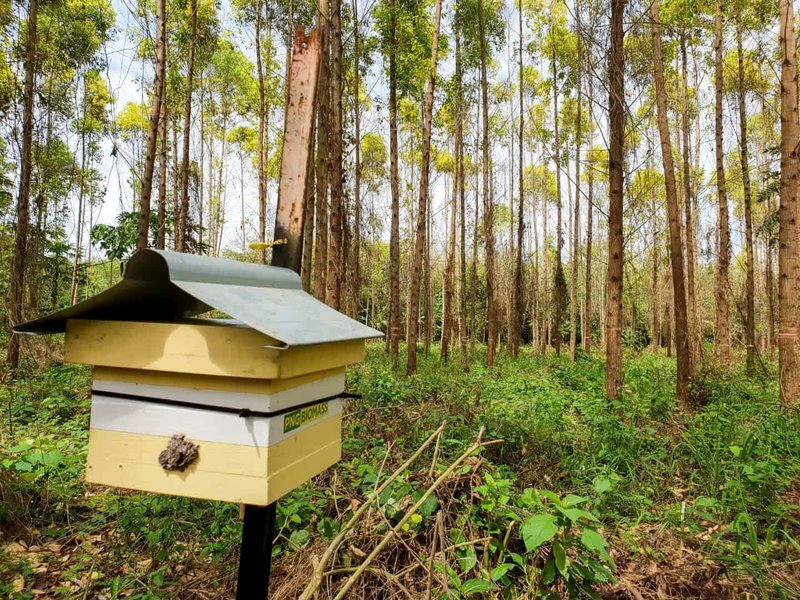 PNG Biomass launched Switpela Bi Hani earlier this year as a pilot program aimed at creating awareness around the presence and value of native bees in the valley and presenting communities with an interesting local business opportunity. The program has engaged meliponist Matthew Middleton, director of the Australian Beezotted, to make regular visits to communities in the area to conduct awareness and training sessions, including ongoing training of local men to produce boxes and bamboo beehives from homegrown materials. His most recent visit focused on introducing native bees to women from the Umi/Atzera region and Chivasing village, explaining the importance of bees in pollinating village gardens, and exploring potential opportunities for bee-keeping and honey production. The Umi awareness session was hosted by Jennifer Baing, who had invited more than 40 local women. With support from KTF Archer Leadership scholar Josh Kamilo, Matthew displayed a box hive populated some months ago with native Tetragonula clypearis bees transferred out of the wall of a local house. Hearing the benefits bees bring, and seeing them close-up, created a real buzz among participants as they savoured the prospect of becoming native beekeepers themselves. Matthew explained that the first step was to find bees in the wild to transfer into a box but cautioned that transferring a wild beehive was a sensitive job, requiring skill and precision. “We left clear descriptions, photos and posters of native bees with the women and asked them to keep their eyes open and ‘think like a bee’. The aim is to identify native beehives in the wild around their homes and gardens but leave them alone for now. On our next visit we will teach them to transfer the bees into homemade boxes and hives,” Matthew said. A similar awareness session in Chivasing village was hosted by Apollo Enkang and well attended by 52 women and 10 men. “Only minutes into the session, the participants suddenly realised that their local small black ‘flies’, which they refer to as biggig, were actually native bees,” PNG Biomass community liaison officer Michelle said. PNG Biomass driver Jack Alois demonstrated a skilled eye for spotting bees when he discovered two hives in a car tyre wall near Apollo’s house. These will be moved into boxes on the next visit. Switpela Bi Hani already has five boxes with native bees, including two species Tetragonula clypearis and Austroplebeia cincta, in the Markham Valley. 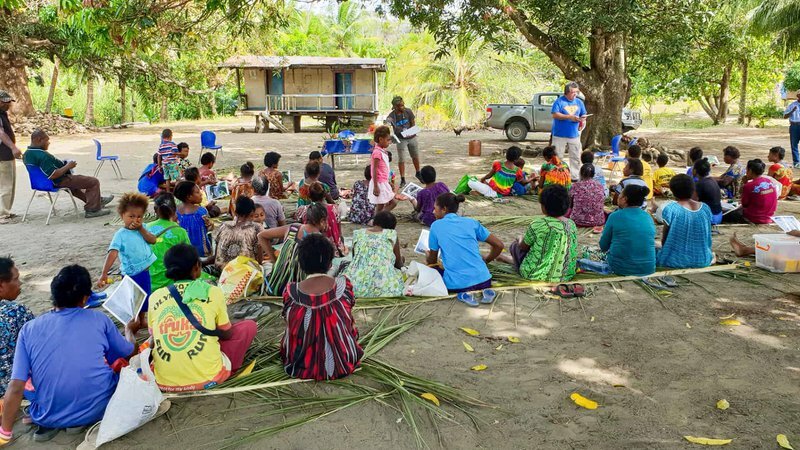 In the next few months the program will continue its training and awareness session throughout the valley, with the support of PNG Biomass and Beezotted.